I must the be the luckiest cowgirl beneath a bronco moon to spend part of my February at both the Elkhorn Ranch southwest of Tucson, and the Flying E Ranch northwest of Phoenix. 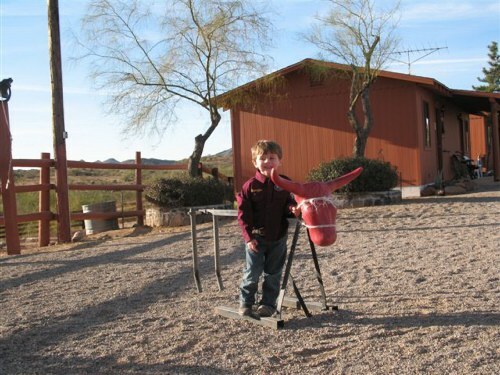 Each winter a colorful denizen of twittering snowbirds from around the globe flock to Arizona’s guest ranches. Many of these migrants return to the same ranch year after year to renew their claim on a corner of the American West. I rode with them through haunting desert landscapes; got my fill of home cookin’; spent an evening listening to cowboy tunes; had a ringside seat for the Gold Rush Days parade, and checked out the best little art museum in the Southwest. 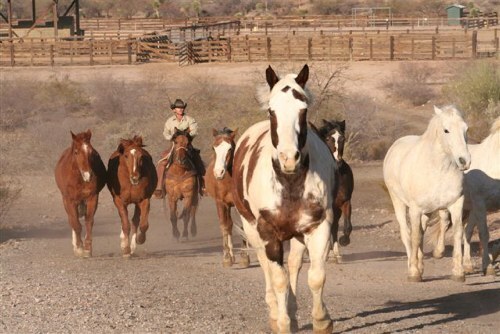 Whether you are looking for a ranch with more comforts than home or a retreat from civilization, there’s a guest ranch in Arizona just for you. “It don’t get any better than this,” Chris, my wrangler guide said as we surveyed the Altar Valley spread out before us like an unfurled quilt framed in the purple ridges of the Sierrita Mountains. In the distance, Mt. Lemon stood cloaked in a frosty white cape towering over Tucson. Behind us, crags of the Baboquivari Range jutted into cobalt skies. 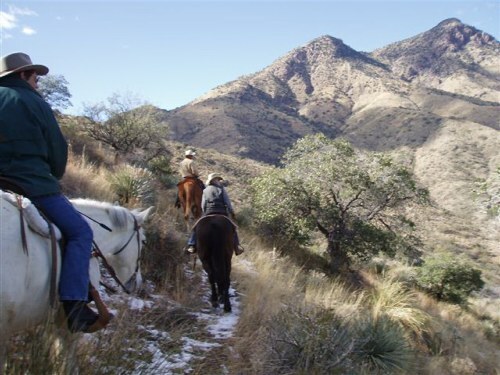 Snuggled into secluded Sabino Canyon just spitting distance from the Mexican border, the Elkhorn Ranch, owned and operated by the Miller family since 1945, remains a hacienda hidden from time. 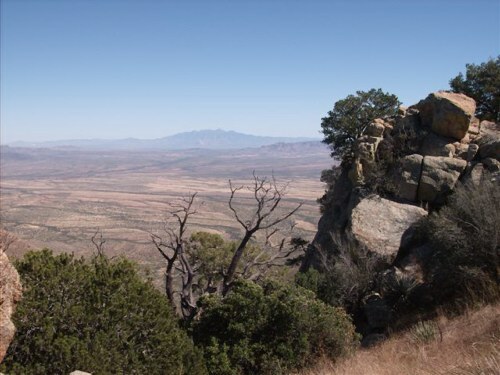 “It’s like mountaineering on horseback,” exclaimed Max, my companion for the day ride across the chaparral, though a mesquite tunnel, up a tricky climb on a less-trod trail to this 360-degree view. Max, a businessman from Switzerland, was visiting the Elkhorn with his partner Alison, an artist who spent the day sketching the weathered windmill behind the barn. The Elkhorn’s isolation and the guests’ mutual respect for solitude makes it a perfect place to get in touch with your creative side. The Miller’s think so, too. In January, they host a painting seminar, and in April, a digital photo workshop. 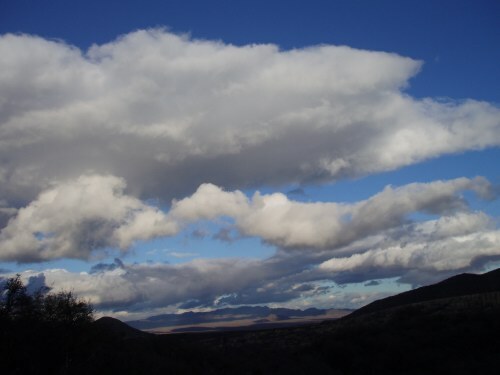 Temperatures this time of year hover around 65-70 degrees, but the ranch sits at 3,700 feet and the weather can be moody. Wear layers and pack a pair of long-johns and weatherproof gloves. On my first morning, I woke to a patter of rain on my window that turned to hail, then snow. Nestled like one of the burrowing animals that live in the desert to protect themselves from the 118-degree summers and the sometime-freezing winters, I waited for the storm to pass. That afternoon, I took a walk up a canyon beside a chatty creek full of itself from the morning rain. Glistening spikes of ocotillo stood in stark relief against a brilliant blue sky and snow clustered at the base of the yucca. Mourning doves lifted at my footfall. I breathed deeply the scintillating air, as the sun burst through slate-gray clouds creating a silver lining on the day. Guests congregate for meals in the Long House with its commanding view of Altar Valley and the big sky that flushes crimson at dawn and dusk. Grandma has some real competition in the kitchen at the Elkhorn. Ham with scalloped potatoes served with crisp greens and apple-pecan pie for dessert was my favorite meal. Breakfast is a choice of every country combo imaginable, including buttermilk biscuits. Killer cookies get tucked into your lunchbox if you want to venture out to explore nearby sites. The Arizona-Sonora Desert Museum about an hour away is part zoo, part botanical garden, and part museum. It’s a favored attraction, along with a drive through the Saguaro National Forest. Nearby Kitt Observatory offers tours for serious stargazers. A few guests linked up for a drive into Tucson to play golf, others ventured to Tubac, a small town with a Spanish flavor, for an art show. But, most guests come to ride the endless miles of trails to stunning vistas. I enjoyed curling up in my casita with a good book. There are no phones or televisions in the pueblos to distract from the desert serenade. Feeders in your own mini-Sonoran Desert garden draw flashy red cardinals, cocky Gambel’s quail, and chirpy black-headed sparrows. When the sun goes down, only yipping coyotes and hooting owls are heard, and the velvet heavens become backdrop for a billion brilliant stars. Wrangler Jake took Max and me for a ride on sandy footing across the desert floor. All I had to do was sit back and rock along in an easy lope on my steady steed,Juarez. Jake let us do a little trail-blazing through shimmering Teddy Bear Cholla. 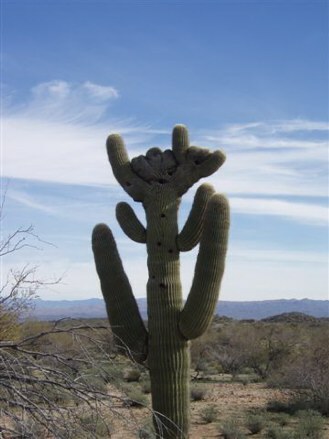 It looks cuddly but, like most desert plants, has sharp needles for defense. The Jumping Cholla attaches to anything that comes near…its clinging clumps sticking and spreading if threatened to be pulled apart. The ubiquitous, hardy Prickly Pear grows in mounds that can turn a great day into a bad one in a hurry if you land in one. We maneuvered our horses through the cacti, chasing jacks that sprang in foot-high leaps ahead of us on our path. Other local wildlife includes the mountain lion, mule deer, wild pigs, a seldom-seen gray fox, and an array of colorful birds. Even though rides in the enchanting country at the Elkhorn filled my adventure bill, I did hear from some muscles that I haven’t talked to in a long time. When I pulled into the Flying E Ranch (a four-hour drive later) and spied the inviting pool and spa overlooking thousands of acres of rolling desert, an audible sigh slipped frommy lips. After checking into my comfy cabin, I rushed to the hot, bubbling waters beneath cloudless blue skies. Lulled by the melody of the cactus wren while weary muscles melted away, my thoughts drifted to the pioneers who first settled here in what can be a hostile land. A black volcanic saddle called Vulture Peak dominates the landscape. Henry Wickenburg gave it this name because when he discovered a fifteen-foot vein of gold about twelve miles south of the Flying E it was one of the scrappy scavengers that led him to the site. Vulture Mine turned out to be one of the richest deposits in Arizona…over a billion modern-day dollars came out of the mine from 1866-1872. Where there is gold, there are folks who want to get at it without doing the work. The old stagecoach road for gold deliveries to Phoenix cuts across the ranch land. A monument at the gate of the Flying E marks the spot of an unsolved gold heist. Legend has it that Apaches killed the outlaws that robbed the stage and all those aboard the stage save two. Supposedly, they then left behind the ore they had no use for. The search for the missing treasure goes on. The riches here for me are rides on well-groomed trails through cowboy country, the chance to spot a little wildlife and to make new friends along the way. Days at the ranch end with happy hour in the saloon that adjourns to the rustic main lodge for a full-service, sit-down dinner with all the trimmings. The relaxed, convivial environment of the ranch is great for a solo traveler or extended families. A three-day minimum stay means lots of comings and goings during a typical week-long stay. I chatted with a frisky 88-year-old who had just arrived with her daughter and granddaughter from the Northwest. The equestrienne sitting next to me had just flown in from across the pond to revisit the West’s wide-open spaces. A strolling cowboy serenaded us while we enjoyed a succulent prime rib dinner topped off with peach cobbler. Ray Caldwell is a living library of western songs dating back to the early 1800s. His rendition of “Wildfire” left me misty; and his “Cattle Call” is enough to calm any herd. The stately Saguaro cactus standing guard at the entrance of the Flying E was here when Vi and her husband George Wellik circled overhead looking for a to land their plane. Vi wanted to create a ranch with resort-like amenities that would be a comfortable place for weekend wranglers to put their boots up. They chose this spot in 1949, and Vi remained gracious hostess of the Flying E until 2004. Today the elder Saguaro is a high-rise for chirping birds that greet guests to the 20,000-acre dude ranch with pool, spa, sauna, and workout room. The barn, lodge, cabins, and manicured grounds are all lovingly maintained by Andrea and Steve Taylor …just the way Vi wanted them to be. I awoke to the clamor of hooves as the wranglers brought the horses in for the day’s rides. Morning and afternoon two-hour rides range from an easy-going-walk-trot-scenic to hold-onto-your-hat lopes. Undulating trails through rock formations tinctured with lichen stir the imagination. Many of the same cacti I saw south of Tucson are here, and in addition are the Palos Verdes trees, and an abundance of Creosote bush. 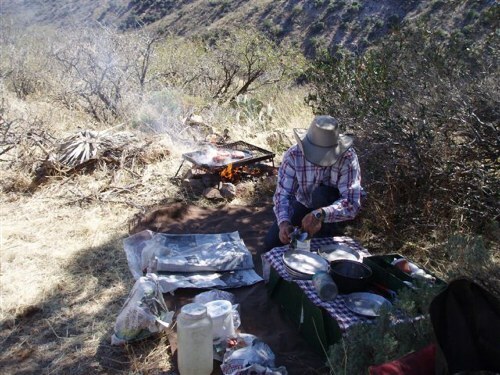 One afternoon each week is dedicated to team penning, and on Sunday mornings the chuck wagon is rolled out for an authentic cookout on the breakfast ride. Pleasures to be had in nearby Wickenburg include the Desert Cabballeros Western Museum, housing western art and a neat mineral collection. A birding hotspot, the Hassayampa River Preserve, is laced with trails though a riparian ecology unique to the region. Hikes up Vulture Peak and into Box Canyon where the Hassayampa flows year round, are worth the effort. The day I arrived in Wickenburg, the 60th annual Gold Rush Days celebration was in full swing. 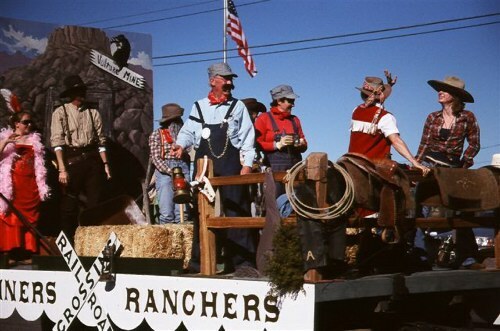 That calls for a rodeo, a dance in the community center, and the descent of thousands of equine visitors upon the town. Guests of the Flying E have front-row seats for the procession of cowboys, Indians, mountain men, the sheriff’s posse, and dance hall girls. One young man wearing a jaunty, red kerchief jumped off of his pony, ran over, and got down on one knee before his sweetheart who was standing next to me. He looked up at her with all the hope and innocence of youth, popped open a box bearing a bright shiny ring, and asked her to marry him. She responded with a shudder of disbelief then jumped into his waiting arms. The romance of the West is alive and well out Wickenburg way. I hope to come back to Arizona in the spring when the cottonwoods, willows, and sycamores that line the creeks are leafed out, and the desert is bursting with blooms. Until then I have the Flying E brand on my boot to remind me what a lucky cowgirl I am.